I’ve always been interested in playing games that have great depth and story behind them. 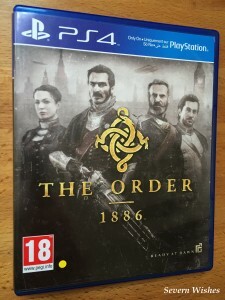 The Order 1886 not only has these qualities, but it also combines historical and geographical facts with fictional mythology. This means players get a unique game that has a blended alternative history, to make a thoroughly enjoyable piece of gaming. So what is so good about The Order? In my opinion the voice actors are superb, at times you really are immersed in their era and are experiencing everything they are, the emotion really made the cinematic sections of the game more realistic for me. Also it’s both graphically and atmospherically beautiful throughout. Over all the game-play itself is quite short, compared to other games which have side missions and extra things to unlock adjacent to the original story-line to complete. I finished the entire game in approximately twelve hours. That included taking my time and replaying sections in order to find all of the collectibles to achieve every PS4 trophy available. The game is an eighteen rating due to the story-line containing dangerous creatures, as well as the use of weapons and violence throughout. As an adult who enjoys the fiction that games such as this bring, it’s like being emerged into a book where you aren’t sure what you are imagining is reality or not. There are twists in this game that you don’t always see coming, which makes it more fun to play. There is nothing worse than too much predictability. So my overall review is that its a fantastic game if you’re a liker of science fiction meets historical fact. Although its a fairly short game, the content within it will make you want to play all the levels. And because its quite a challenging game, I’m sure that you have some enjoyable hours completing it.